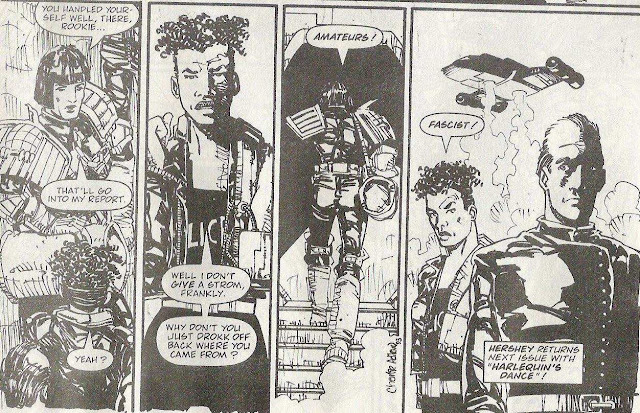 Bill Savage was hardly new, but Adlard did get to reinvent him for a new age. 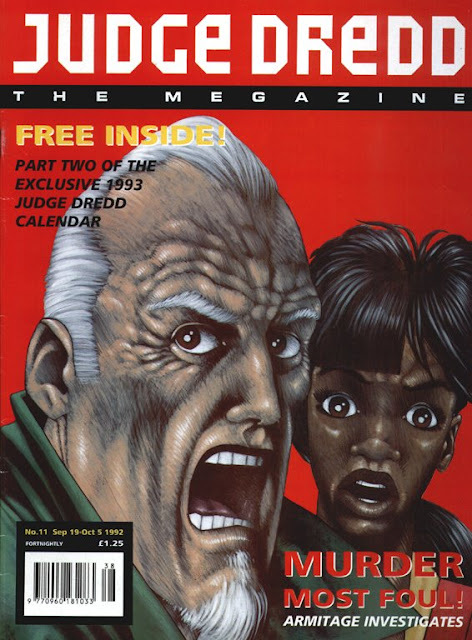 Judge Logan was a new character introduced by Adlard, but not exactly a ‘creation’ as he’s based on the late Stewart Perkins, a real-life person (and 2000AD fan) who truly earned his way into the fictional world of Mega City One. before we get to Adlard the supremely confident cartoonist. For me the most notable thing about Adlard’s work is that he’s just so accessible and easy-to-read. There’s a reason that the Walking Dead became a huge hit under his pen, and it’s a lot to do with the fact that people who don’t normally read comics can slip into his style without having to muddle through the trick of learning how to actually read comics. Other more specific characteristics include: big eyes, but never Manga eyes; a surface sheen to pretty much everything, from skin to clothes to just the air around the characters. He also has a real knock for knowing when to draw full figures, when to draw half-figures, and when to go for the close-up. I’m in danger of repeating myself here, not because Adlard is really like any other 2000AD artist in his style, but because he’s another of the new wave that emerged a) in the early 90s and b) on David Bishop’s Megazine. Another talent who perhaps was not at his best from day one, but was well nurtured and given enough chances to get properly good. 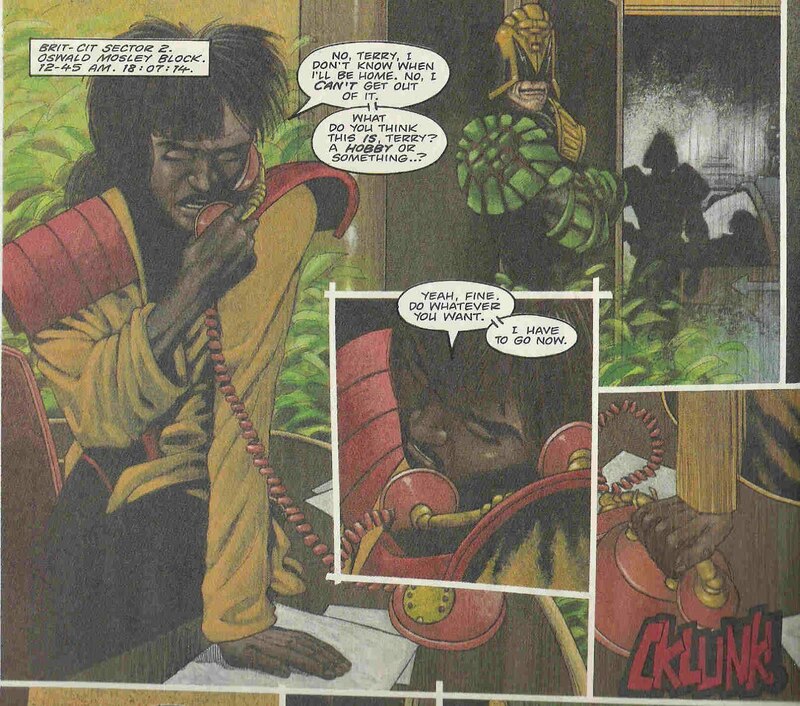 And let’s be clear, like many of his contemporaries, he can be forgiven for his earliest efforts because he was basically forced into doing the painted art thing, and, more specifically on his first series, trying to do it like master craftsman Sean Phillips. The colours and textures match Sean Phillips's previous series remarkably well. 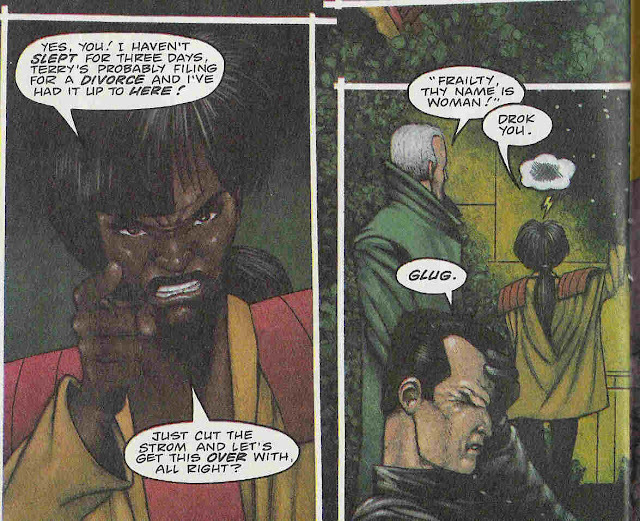 What strikes me most about these early pages from Armitage are the expressions, which stand out as Adlard’s own voice. Following the template from Phillips and of course writer Dave Stone, Steel is angry and Armitage is bitter. 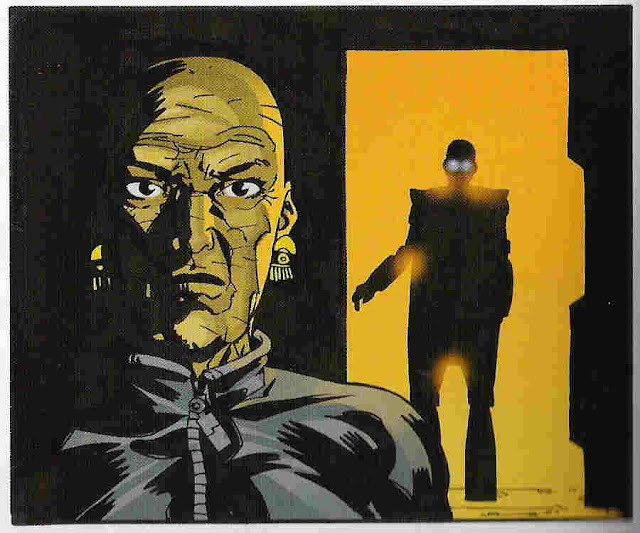 But where Phillips displays this as much through fashion and posture, Adlard kind of brings the emotion to the fore and puts it in their eyes and faces. Could be a page right out of Walking Dead, no? 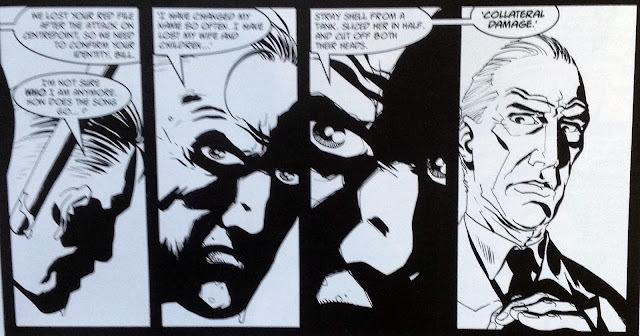 I, for one, much preferred the look in this ‘Flashback’ sequence from Armitage (a meta-text reason for Adlard to use the black and white style, although I’d be curious to know if this was an editorial suggestion in the first place). It’s clear from this work that Adlard was a pretty great draw-er. And, compared to his earlier painted work, the tone and atmosphere really come through. There’s a bleak grandeur to his image of Birmingham as post-nuclear wasteland that makes it easy to imagine yourself there. 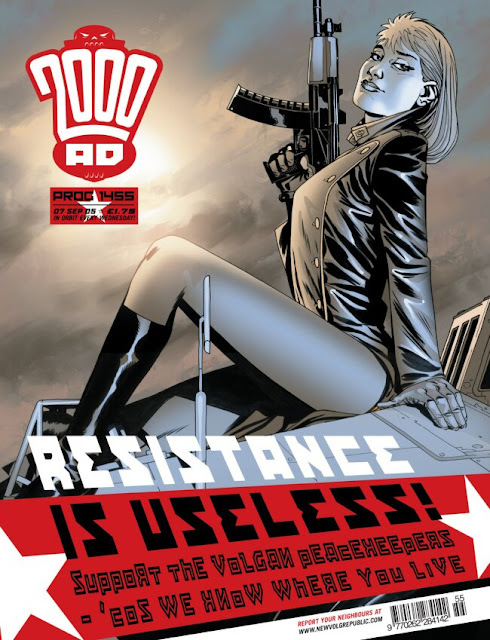 In largely the same style, Adlard brought Treasure Steel over for a team-up with Judge Hershey, and he earns many points for being a boy’s adventure comic artist who draws action-adventure women as nature intended them, i.e. not as fodder for ogling readers. 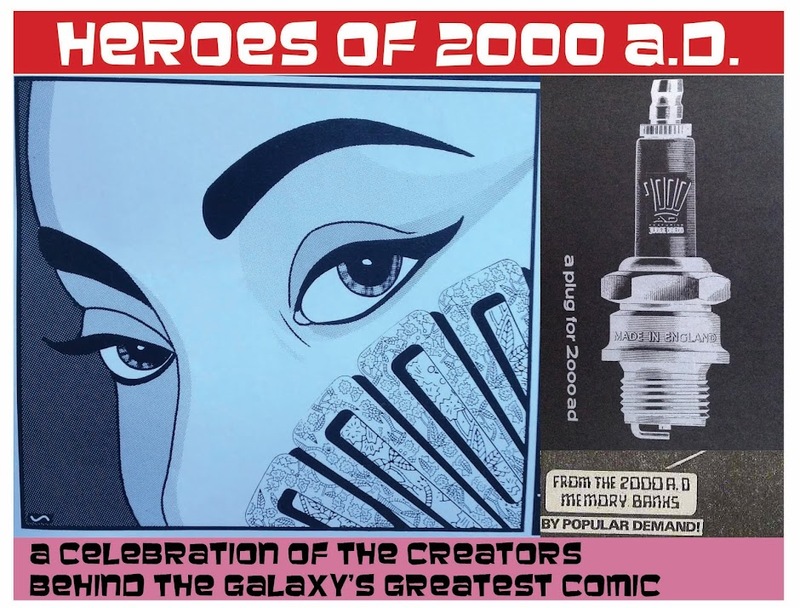 It’s weird that I feel the need to point this kind of thing out, but even in 2000AD there have been artists who draw men as characters and women as pin-ups. inner thoughts and feelings of the characters. Note the subtle smugness on Andreas Romanov. For a while there, Adlard was the clear best of the deputy Dante artists. Unusually for a new artist, Adlard has only drawn a single one-off type strip for Tharg, an episode of Pulp Sci Fi. It's worth bringning up becauise it's one of the very few bits of full-on science fiction space opera type thing that Adlard has done (to my knowledge), and I wouldn;t have thought it'd be his thing. Of course I was wrong! City-wide devastation and crazy spaceships galore! Epic. 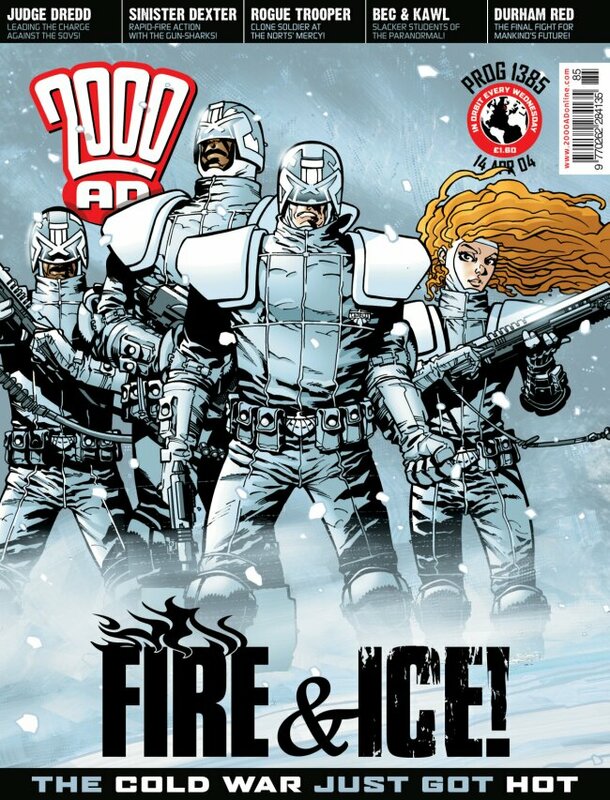 I’m not sure if was kicked off by John Burns (and you wouldn’t say no to John Burns if he asks for a gig, now would you), or if they just chose to swap over, so Burns got Dante and Adlard moved onto Dredd. 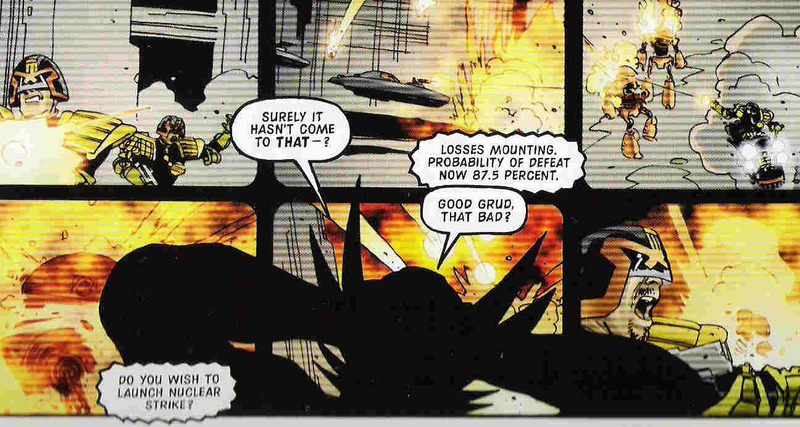 Again, it’s the tone and atmosphere that shines through in his Dredd, although if I’m honest his cartooning doesn’t fit this character and his world nearly as neatly as it did on Dante. His epsiodes of the sprawling 'Doomsday' epic were, as ever, easy to follow (unlike a lot of that story), but perhaps a little basic (althoguh there again, one can lay a lot of blame on the lacklustre plotting - no offence, John Wagner, but it wasn;t your finest hour!). Super-villain watches action on video screens. Ho Hum. A refreshing use of close-up and silhouette, rendering this moment that much more dramatic. A couple of years later, he did get to have a bit of fun on The Satanist, a very odd story in which Dredd is plagued by psychic visions that turn out to emanate from a Satanic cult leader in Brit-Cit who may in fact be the actual devil. 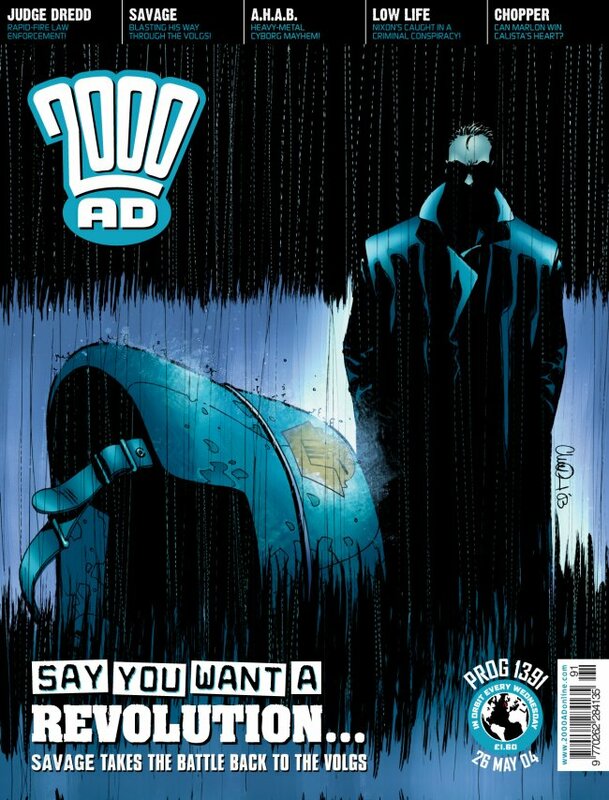 Oh, and it features Vienna Dredd in a big way, pushing that rare Dredd-thread of wondering just how much he’ll let himself be pulled around by his family ties, and whether or not he is capable of plain and simple familial love. If anyone but Wagner had written the script, people would’ve cried foul, I’m sure. Adlard uses his way with a close up to make sure the emotional through-line is clear. Vienna isn;t crying, or meant to be, but by gum you can see the film of water that keeps her eyeballs clear. What do you do with someone who has natural skills as a cinematic storyteller and a finder of emotions? Why, give him a shotgun-wielding nutter to draw. Funking Hell! Bill Savage is back. Except that Savage isn’t Invasion. Sure, Bill Savage is the same person – and even the same character – in both series, but the trappings couldn’t be more different. Where Invasion was (for me, as a reader who only knows it as a strip from ye oldene days of the Prog) an excuse to revel in gleeful, vengeance-fueled violence, Savage was, and remains, a hard-hitting look at what it would be like to live in a country that has been invaded and overtaken by a hated enemy. Reading those early books in 2003, right in the middle of media onslaught covering our invasion of Iraq, it was powerful, poignant stuff. but mostly what he brought was a thick atmosphere of despair and anger, lightened by a tinge of hope. Although ‘hope’ in this case means ‘occasionally getting the chance to murder some Volgs and not get caught’. but mixing up the angles and expressions to match the mood fo the dialogue. MUCH harder than it looks. 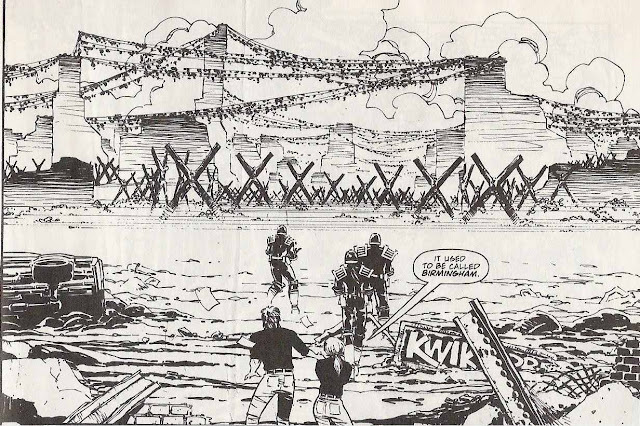 There’s a dichotomy at the heart of Adlard’s art. He’s so accessible, even freindly in his style, and yet it has lent itself extraordinarily well to tales of doom, gloom and pointing out the hypocisies of the world we live in. 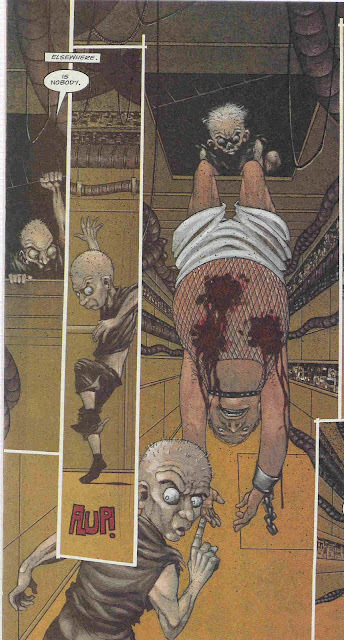 Couldn;t end without another trademark Adlard extreme close up! I guess one day the Walking Dead will eventually end (even though it’s not supposed to), and maybe one day Adlard will find himself on the Prog, delivering an epic 200-part series without ever missing a week. A Belardinelli-style workaholic in waiting? Unsurprisingly, dude is all over the internet, and he's happy to tlak about his 2000AD work as well as Walking Dead.